One of the biggest mistakes new runners make is failing to invest in proper equipment. 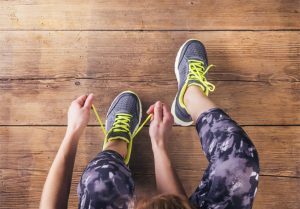 While it’s true that running is an inexpensive sport — all you need is some footwear and the great outdoors — it’s essential to choose the right running shoes. Jacksonville orthopedic specialists recommend getting personalized recommendations and then visiting a local running store to achieve the best fit. Comfort. For good running shoes, comfort is king. In fact, scientific research studies suggest that comfort is the number one consideration to make when purchasing new running shoes. As you try on shoes, consider the amount of cushioning, arch height, shape of the heel, thickness of the heel and other factors. If a shoe doesn’t feel comfortable to you, don’t choose it. Pronation. Pronation refers the amount that your foot rolls inward as you land during each stride. The opposite, a rolling outward of the foot, is called supination (and is much less common). Traditionally, runners have believed that over-pronation can result in running injury. Certain shoes can help compensate for over- or under-pronation. Although the scientific research suggests that this factor may not be as important as previously believed, some runners do appreciate the support of a shoe that corrects pronation. Size. When you run, your foot may slide forward slightly in your shoe. Although you do not want your shoes to be too large for your feet, many runners find it comfortable to go up a half size from their street shoe size. You should have plenty of room in the toe box to wiggle your toes, but shoes should not risk slipping off your heel as you stride. Insoles. Remember that you might not walk out of the store with a perfect pair of running shoes. Many runners rely on specialty insoles to make their running shoes more comfortable. Ask your orthopedic doctor if insoles are a good idea for your feet. Material. The best running shoes are durable, breathable synthetic leather with nylon mesh. If you do a lot of outdoor running, thermoplastic urethane overlays improve durability and stability. Failing to get good running shoes could result in joint pain or injury. Talk to your orthopedic doctor at Southeast Orthopedic Specialists for running shoe recommendations. Investing in the right footwear will result in long-term dividends as you avoid injury and stay physically active.